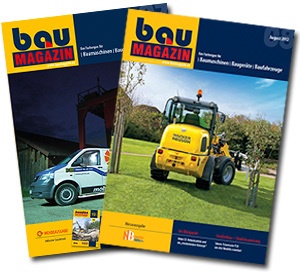 The bauMAGAZIN is one of the leading trade magazines for the construction industry. It is getting circulated all over Germany and German-speaking European countries with a monthly edition of 18,500 units on average. The perfect target group for the divisions construction machinery, construction equipment and construction vehicles will be chosen every month related to a special topic out of a categorized data file of 66,777 addresses. This guarantees highest advertisement efficiency – spreading losses are nearly impossible. The topic preparation is effected up-to-date with product novelties, construction site reports, interviews, company portraits, business news or »on-site« appointments (»on-locations«) by our editors. Furthermore you can find the bauMAGAZIN at all important exhibitions reporting about the current news. In each edition the monthly changing topics are finished clearly structurized and published (please see the editorial topic plan). Month per month the target group of the readers levels at the topic focal point of the magazine. This corresponds to our strategy, to counter spreading losses successfully. 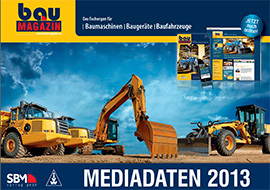 In clear design with topic related text and picture articles well as monthly current press announcements the bauMAGAZIN offers builders of all branches worth knowing information about construction machines, devices, accessories and vehicle technics as well as their use. A first class date bank is the basic condition for our business philosophy: with currently more than 66,000 well-kept address data of the construction industry from Germany and abroad we give you the security of a high advertisement effectiveness with an unimportant spreading loss.